Yoshikawa wrote the samurai epic Musashi (see review #75). Since I enjoyed that book, I thought I would read Yoshikawa's autobiography. The translator's introduction warns that it covers only his early youth, and repeats itself a bit. Indeed it is disappointing not to see how the boy succeeds in becoming a writer, because his early youth was dreadful enough for Dickens. He is of very minor samurai stock: Yoshikawa recalls being humiliated at a lecture (once he was famous), where someone had researched his ancestry and found that his grandfather had a stipend of only enough rice for about two people. However, his father became a successful importer in Yokohama, and for a while they prospered. His father was very severe, and would do things like forcing his children to deliver his lunch by walking barefoot several miles in the rain. There were four children, although I may have missed several who died, and Eiji the eldest (not his name at that point, but I won't confuse the issue). Dad enjoyed mistresses and the Kannai section of Yokohama, equivalent to Tokyo's Yoshiwara geisha district. He smoked and drank, sometimes going on several-day binges with his work cronies (if I sometimes feel like an alcoholic, at least I can reflect that I have not yet coughed up blood at the end of an evening, as Y's father did). Business fell off during the war with Russia, and then Y's father came to blows with an associate, who sued him successfully. At this point the father goes to prison, and things start disappearing from the house. They keep moving to smaller and smaller houses in poorer and poorer areas. Finally Eiji must leave school and is apprenticed to a seal cutter, but released when the shop owner finds Eiji's caricature of his wife. Yoshikawa gets a job selling household items from a box on his back. At one point he visits some rich former friends and is intensely humiliated. Later he works at the dockyards, painting ships or knocking the rust off them. Many coworkers got killed one way or another, and Eiji quits after a 50-foot fall that puts him in the hospital for a long time. At various times he comes home to find his family mostly starving, though this does not stop his father from ordering sake whenever possible. During such crises, Eiji steals potatoes from fields, or orders noodles on credit. All along Yoshikawa remarks on girls that he fancies but never dares to speak to. One of these is sold as a maid, and her brother tells Yoshikawa later that she died saying his name. There are many grim moments, but the author maintains that through it all he was annya-monnya, or lost in childish dreaminess. He always wrote haiku, and occasionally won prizes for it and visits from newspapermen, which just embarrassed him. Nevertheless, in looking back over the muddy road their parents trudged along, children may learn something of value that will help prepare them for the long road stretching ahead of them. My own father, perhaps, without intending to, made my road muddier than it need have been; but even so, at the time of his death, I had barely graduated from the middle school of life, and the foregoing account is my report card from that school. I was afraid of Father; yet, strangely enough, frightening fathers and teachers are sometimes remembered fondly and even gratefully by their offspring and former pupils. I thought it was interesting reading. Having been born in Yokohama, I never paid much attention to foreigners. But I do remember sensing something vaguely patrician in the leisurely way the beautiful, fair-haired women and their gentlemen companions walked about the garden, having nurserymen cut peonies or carry large pots of flowering wisteria for them, and pausing to look at the azaleas and irises on their way out. At such times, even the insects flying about seemed to carry the fragrance of flowers on their wings and emit a shining light from their bodies. I have two publications from this nursery, that I got off Ebay, which you can see on this page. 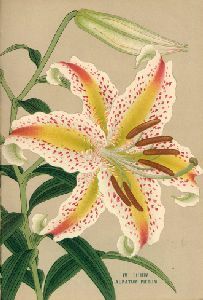 They are beautiful and fascinating (the book of lilies is from 1907). 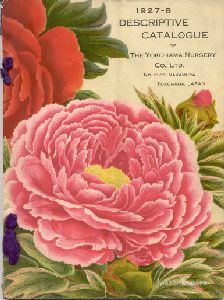 With a bit of web surfing, I learned that it was from Yokohama Nursery that David Fairchild, the famous American plant hunter, first imported Japanese flowering cherries to his home in Chevy Chase, Washington DC. It was Fairchild's book Garden Islands of the Great East that persuaded Patricia and me to visit Indonesia before we moved to England, so we could eat salaks, soursops, mangosteens and woewoes, and maybe see a coconut pearl. Most palms in the US came via Fairchild. Factoids: Yoshikawa couldn't abide either milk or English. Not done yet! If you like historical Samurai books, I can recommend Musui's Story , the autobiography of a Tokugawa samurai. What a thug! When he runs off into the countryside without a penny, I am reminded of scenes from Musashi. Thanks to Luke for this book, and the many other gifts his family brought along on their visit, including the video with Luke in it!